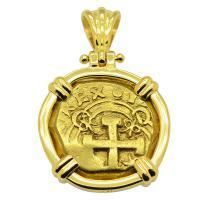 Spanish 2 escudos "Doubloon" 1566-1590, in 18k gold pendant. 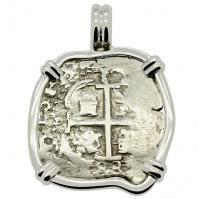 Spanish 4 maravedis dated 1617, in 14k white gold pendant. 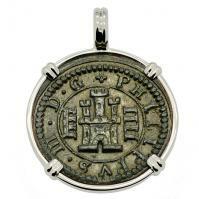 Spanish 8 maravedis dated 1606, in 14k white gold pendant. 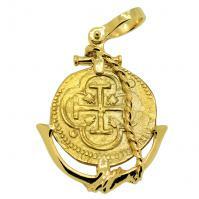 Spanish 8 maravedis dated 1623, in 14k gold pendant. 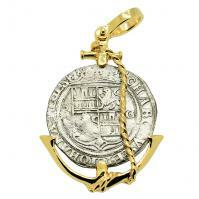 Colonial Spanish Mexico, King Philip IV two reales 1623-1665, in 14k gold anchor pendant. 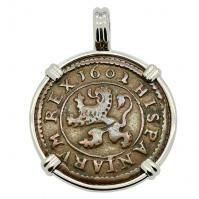 #9922 SOLD King Charles II Spanish 1 Real Pendant. 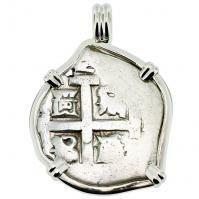 Please Explore Our Spanish Treasure Pendants For Similar Items. 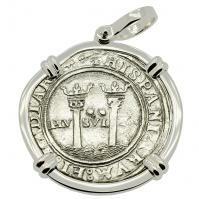 Colonial Spanish Peru, King Charles II one real dated 1683, in 14k white gold pendant. 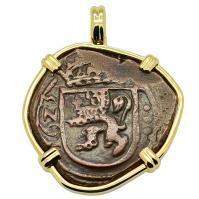 Colonial Spanish Peru, King Charles II one real dated 1690, in 14k gold pendant. 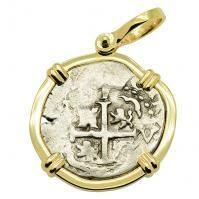 Colonial Spanish Peru, King Charles II one real dated 1692, in 14k gold pendant. 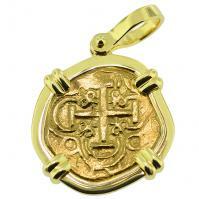 Colonial Spanish Peru 1 real with full 1667 date, in 14k gold pendant. 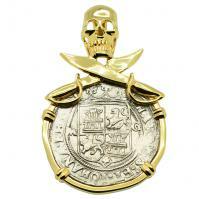 Colonial Spanish Peru, King Charles II one real dated 1688, in 14k gold skull & swords pendant. 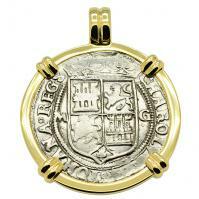 Colonial Spanish Peru, King Charles II two reales dated 1675, in 14k gold pendant. 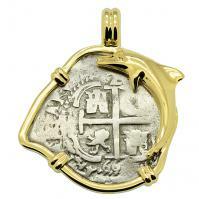 Colonial Spanish Peru, King Charles II two reales dated 1680, in 14k white gold pendant. 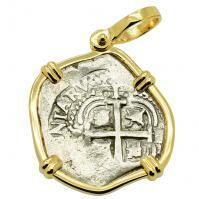 Colonial Spanish Peru, King Charles II two reales dated 1672, in 14k gold pendant. 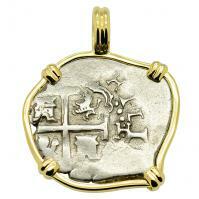 Colonial Spanish Peru, King Charles II two reales dated 1692, in 14k white gold pendant. 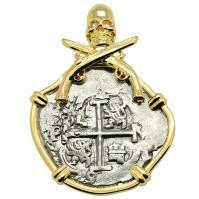 Colonial Spanish Peru, King Charles II two reales dated 1697, in 14k gold skull & pistols pendant. 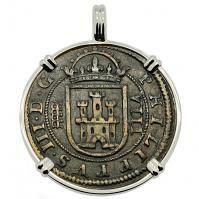 Colonial Spanish Bogota 2 escudos "Doubloon" 1703-1715, in 18k gold pendant. 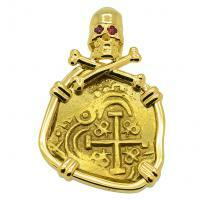 Colonial Spanish Bogota 2 escudos "Doubloon" 1703-1715, in 18k gold Skull & Bones pendant with rubies. 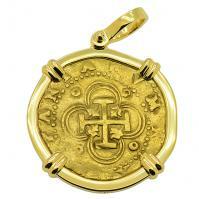 Colonial Spanish Bogota 2 escudos "Doubloon" 1730-1744, in 18k gold pendant. 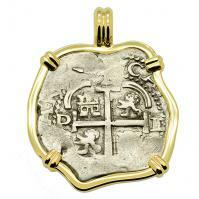 Colonial Spanish Bogota 2 escudos "Doubloon" 1722-1732, in 18k gold pendant. 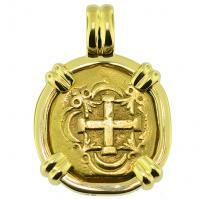 Colonial Spanish Peru, King Philip V one real dated 1709, in 14k gold pendant. 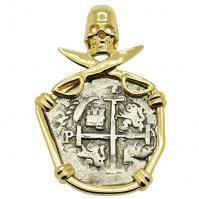 Colonial Spanish Peru, King Philip V one real dated 1715, in 14k gold pendant. 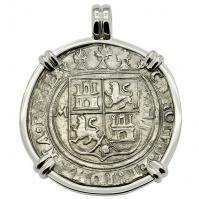 Colonial Spanish Peru, King Philip V two reales dated 1722, in 14k white gold pendant. 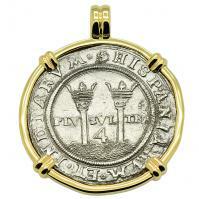 Colonial Spanish Peru, King Philip V two reales dated 1731, in 14k white gold pendant. 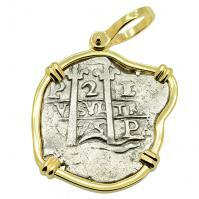 Spanish 2 reales dated 1732 in 14k gold pendant, 1743 British East India Co. shipwreck. 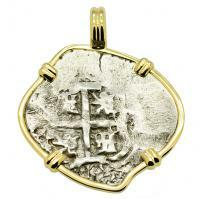 Spanish 2 reales 1542-1548 in 14k gold pendant, 1550 shipwreck Northern Caribbean Sea. 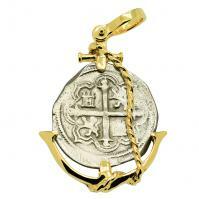 Spanish 2 reales 1542-1548 in 14k gold anchor pendant, 1550 shipwreck Northern Caribbean Sea. 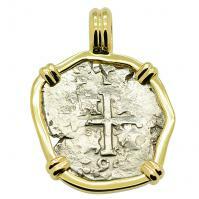 Spanish 2 reales 1542-1548 in 14k gold skull & swords pendant, 1550 shipwreck Northern Caribbean Sea. 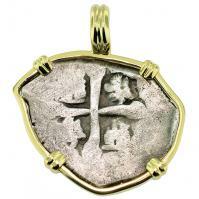 Spanish 4 reales 1547-1550 in 14k white gold pendant, 1550 shipwreck Northern Caribbean Sea. 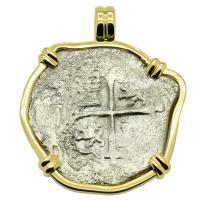 Spanish 4 reales 1547-1550 in 14k gold pendant, 1550 shipwreck Northern Caribbean Sea. 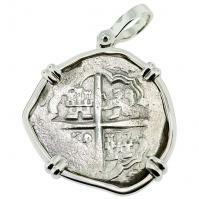 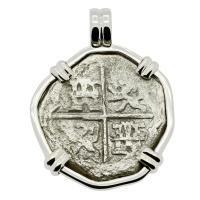 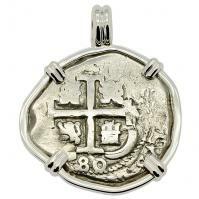 Spanish 4 reales 1598-1621 in 14k white gold pendant, 1622 Portuguese Shipwreck, Mozambique, Africa. 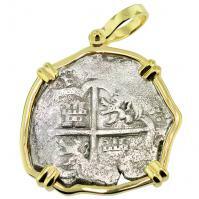 Spanish 4 reales 1618-1621, in 14k gold pendant, 1622 Portuguese Shipwreck, Mozambique, Africa. 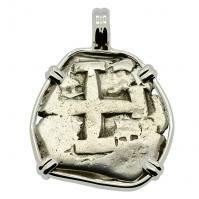 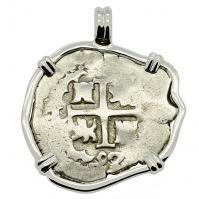 Spanish 4 reales 1598-1621, in 14k white gold pendant, 1622 Portuguese Shipwreck, Mozambique, Africa. 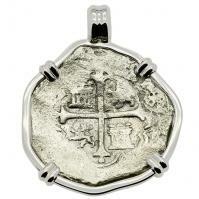 Spanish 4 reales 1607-1617, in 14k white gold pendant, 1622 Portuguese Shipwreck, Mozambique, Africa. 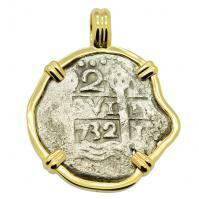 Spanish 4 reales 1612-1620 in 14k gold pendant, 1622 Portuguese Shipwreck, Mozambique, Africa. 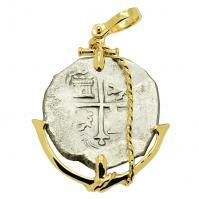 Spanish 4 reales 1618-1621, in 14k gold anchor pendant, 1622 Portuguese Shipwreck, Mozambique, Africa.